So now that I’m older and wiser (clearly), I feel I’m very equipped to tell you about what you should be eating and feeding your family! When I was a kid I had this thing with Campbell’s Cream of Mushroom Soup, I know, I know, what was I thinking? But there was something comforting about it and frankly, in college it was so easy to make and so delicious with some saltine crackers. One can + instant happiness. 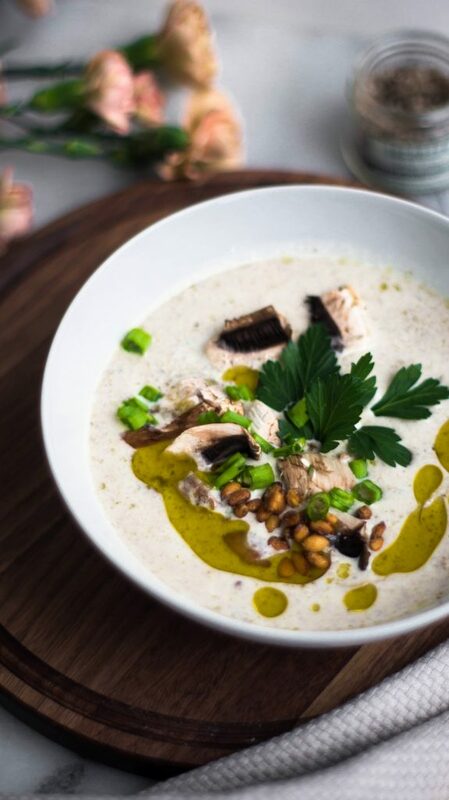 I had this craving to make a soup like I used to enjoy (when I was young) a cream of mushroom soup that is a little more adult and full of flavor. We’ve had quite the bout of sickness run through our household so soups have been a bit hit! I made a big pot of this and a big pot of my Chicken Noodle Soup and slowly, through the power of food, rest and medicine, everyone is on the mend again. 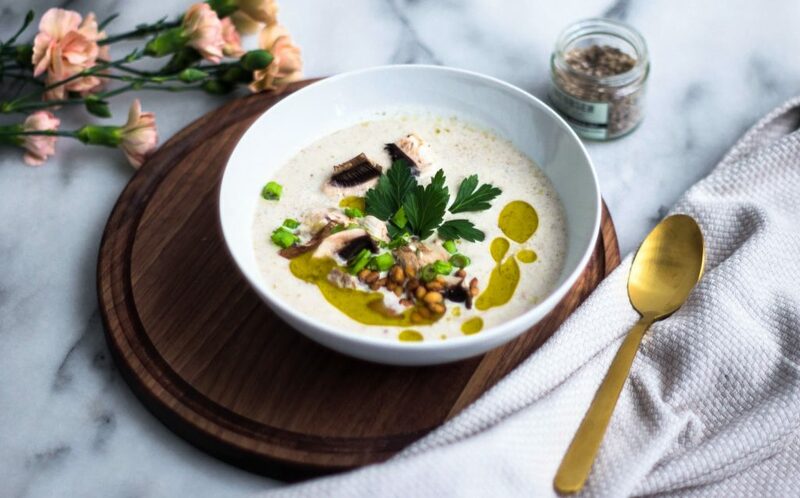 The beauty of this soup is that it takes less than 30 minutes to make, perfect for a meatless dinner, a dinner party, easy enough for a weeknight dinner or even for a holiday gathering. I love pairing simple rustic ingredients that are packed with so much flavor. The earthiness of the mushrooms combined with the freshness of the thyme and bit of cream make this hearty and so satisfying. I hope you give this recipe a try and include it in your rotation of meals. As always, I love seeing your creations, tag me on Instagram @CosettesKitchen or post on my Facebook Page. Begin by prepping your mushrooms by cleaning them with a damp paper towel. Gently wipe the tops and stems with the damp paper towel to remove any dirt. Do not submerge mushrooms in water. Heat 2 tablespoons of butter in a frying pan and add your assorted mushrooms (baby bellas + maitake) and 2 sprigs of thyme and a dash of salt. Cook until tender and set aside. In a heavy-bottomed pot, heat 2 tablespoons of butter and add chopped shallots and sliced crimini mushrooms. Let the mushrooms and shallots soften, continue to stir until the liquid from the mushrooms begins to evaporate, about 5-7 minutes. Add in your minced garlic and the leaves from about 8 of your thyme. Stir until fragrant, just a few minutes making sure the garlic doesn't burn. Add in 4 tablespoons of butter and your flour to coat your mixture. Slowly add your vegetable stock while stirring. Bring the mixture up to a gentle boil, then reduce and remove from heat. Place your immersion blender in the pot and blend the mushroom mixture until desired consistency. Place pot back on heat and add in your other mushroom mixture and 2 cups of heavy cream. Salt & pepper to taste. You can certainly keep your mushrooms all whole and saute all together if you prefer and avoid blending. I enjoy the smooth and creaminess with some delicious meaty mushrooms. Thank you for the beautiful and simple recipe. This was so rich and flavorful I went much lighter on the cream than suggested — 1 cup of half and half instead of two cups of heavy cream. It was really plenty! I had a large bag of foraged Hen of the Woods mushrooms to use, so I separately sautéed those, added some of the stem pieces to be puréed with the base soup, and then scattered the rest on top of the finished soup instead of mixing in- made for a gorgeous presentation with the golden-hued ‘shrooms spread across the top!